The family in my tree connected to Portland was the Theisinger family. The two brothers, Jacob and Phillip Theisinger, came to Australia in October 1855 on the ship “Ben Nevis”. At the time, Jacob was married with one child, while Phillip was still single. Peter Theisinger was born in 1858 in Geelong. He moved to South Australia. William Theisinger was born in 1863 in Portland, and died in 1943. He moved away from Portland. William appears to have never married. Elizabeth Theisinger was born 14 May 1865 at Hurd Street Portland. She married Patrick John Theodore Mulder on 22 September 1883 at Portland. They then moved to Melbourne. Jacob died 14 September 1901 in Hurd Street, Portland. His wife Catherine died 1 July 1891 at Hurd Street Portland. They were both buried at the Cemetery South in Portland. Christine Theisinger born in 1863 in Portland, died in 1864. Alice Theisinger born 23 Dec 1868 at Portland, died 1891 at Portland. Alice was married to William Thomas McWilliam. They had one daughter, Charlotte, who was born in 1889 in Portland. After Alice died, William married her sister Charlotte. Phillip Henry Theisinger born in 1869 at Portland. Phillip moved to Melbourne. Charlotte Theisinger born in 1872 at Portland. She married William Thomas McWilliam after her sister Alice died, and their first four children were born at Portland, and the rest of their children were born at Branxholme, the youngest born in 1911. Charlotte died in 1911 at Portland. Samuel Theisinger born in 1874 at Portland, died in 1874. Arthur Theisinger born in 1875 at Portland, died in 1877. Frederick Theisinger born 18 Aug 1879 at Portland. Frederick died in 1910 in Queensland. Charles Theisinger born 1881 at Portland, died in 1881 at Portland, aged 1 day. Phillip’s wife Charlotte died in 1889 at Portland. Phillip then married Ellen Gaisford in 1893, and Martha Williams in 1901. Phillip died in 1910 at Portland. Catherine Theisinger was born in 1854 in Liverpool, England. Catherine married William Munro in 1877, and they had one child, Catherine Elizabeth Munro, before William died in 1884 at Portland. Irene Marion Stroud Jones born in 1890 at Portland. She died in 1971. Little is known about Irene at this stage. Avron William Murray Jones born in 1893 at Portland. He died in 1939 at Portland. It is not yet known if he was married. Phillip Arthur Theisinger born in 1885 at Portland, died in 1893 at Portland. Herbert George Theisinger born in 1887 at Portland. Herbert moved to England. Sydney Charles Theisinger born in 1891 at Portland, died in 1891 at Portland. Daisy Linda Theisinger born in 1892 at Portland. She moved away from Portland sometime between 1914 and 1919. Pearl Elizabeth Theisinger born in 1895 at Portland. Pearl was still living in Portland at the time of her marriage in 1937, and then moved away from Portland. She died in 1940. Norman Lloyd Theisinger born in 1896 at Portland. He was killed in action in WW1. Edith Florence Theisinger born in 1898 at Portland. She died in 1925 at Portland. Martha Surrey Theisinger born in 1900 at Portland. She died in 1935 at Portland. Lawrence Edgar Theisinger born in 1902 at Portland. He died in 1985 at Portland. Olga Ruby Theisinger born in 1908 at Portland. She died in 1908 at Portland. We regret to record the death of another old and highly respected resident of Portland, in the person of Mr. Phillip Henry Theisinger, who passed away at his residence, Gawler street, at the ripe age of 86 years. He was born at Geelong, arriving in Portland at the age of three years, and spent the remainder of his life here. For many years he served as storeman for Messrs Campbell & Sons, merchants, and later was secretary of the Portland Waterside Workers’ Union. Throughout his long association with the town he bore the name of a good workman and citizen, and held the esteem of all who knew him. He was a genial and trustworthy companion, ever ready to assist a good cause. He was gifted as a musician, and gave many years (45 to be exact) of his life to the Portland Citizens’ Band. He was a member of the Portland Masonic Lodge, and held office, In the Foresters for 59 years. In early manhood he married Miss Sarah Ann Surrey, who was also a member of one of Portland’s earliest families. By the union there was a family of twelve children, of whom three survive. A sister of deceased, Mrs. W. H. Jones, died at few years ago. Bert, a son in England, has a family of four boys and two girls, three of the former serving in the British Army. The funeral, which took place on Sunday, was largely attended. Mr. and Mrs. Theisinger celebrated their golden wedding in March, 1933. They have lived in the same house in Gawler street for 59 years, ever since their marriage. 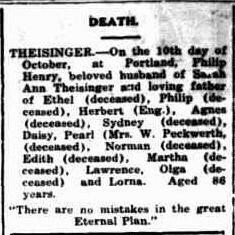 THEISINGER.-On the 10th day of October, at Portland, Philip Henry, beloved husband of Sarah Ann Theisinger and loving father of Ethel (deceased), Philip (deceased), Herbert (Eng. ), Agnes (deceased), Sydney (deceased), Daisy, Pearl (Mrs. W. Peckwerth, (deceased), Norman (deceased), Edith (deceased), Martha (deceased), Lawrence, Olga (deceased) and Lorna. Aged 86 years. His wife Sarah died later the same year, on 17 October 1942, also in Portland. DEATH. THEISINGER (Nee Surry). 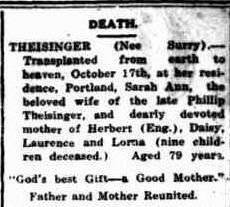 Transplanted from earth to heaven, October 17th, at her residence, Portland, Sarah Ann, the beloved wife of the late Phillip Theisinger, and dearly devoted mother of Herbert (Eng. ), Daisy, Laurence and Lorna (nine children deceased.) Aged 79 years. “God’s best Gift-a Good Mother.” Father and Mother Reunited. Phillip and Sarah’s death notices mention another child: Lorna. Lorna doesn’t appear on the bdm indexes up to 1916. I found an article on Trove (Our District School (1937, December 20).Portland Guardian (Vic. : 1876 – 1953), , p. 3 (EVENING.). Retrieved April 19, 2016, from http://nla.gov.au/nla.news-article64277855). This article indicates Lorna was still at school in 1937. Sarah was born in 1863, so Lorna is unlikely to have been their birth daughter, and more likely to have been adopted.